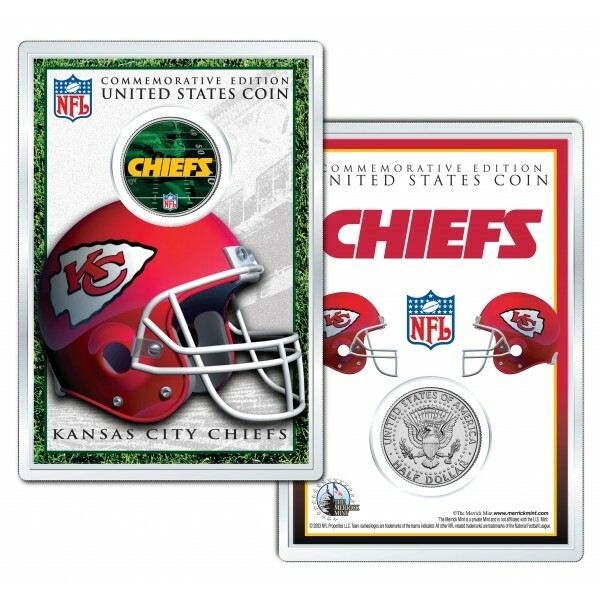 Here is your chance to own an OFFICIALLY LICENSED, beautifully colorized JFK Kennedy Half Dollar U.S. coin that is beautifully colorized with the licensed NFL image of your favorite NFL team, the KANSAS CITY CHIEFS. 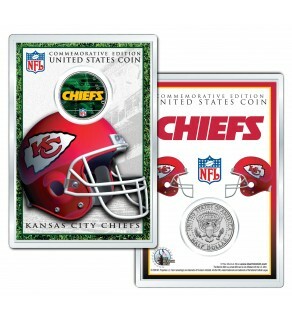 Each coin is officially licensed and approved by the National Football League (NFL). This high-quality genuine Legal Tender U.S. coin has been colorized using a unique painstaking multicolor authentic process by the Merrick Mint. Colorizing coins involves the unique application of special inks directly to the surface of a coin that achieves a level of detail, color saturation, and durability that is #1 in the coin industry. The result is an everlasting colorized coin collectible of ultra-high quality. Each coin comes displayed on a die-cut display with beautiful artwork sealed in a 4” x 6” acrylic airtight case. 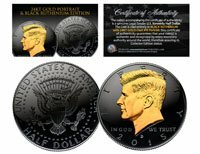 The Kennedy half dollar is a U.S. fifty cent coin with coin year and mint marks chosen at random.